High/Low, Turbo Options, Long Term, Pairs, One Touch. First monthly withdrawal is free, additional withdrawals cost $12. Wire transfers cost $25. $25 minimum for withdrawals. If you are looking for a broker that serves customers around the world, including in the USA, you may be interested in uTrader. 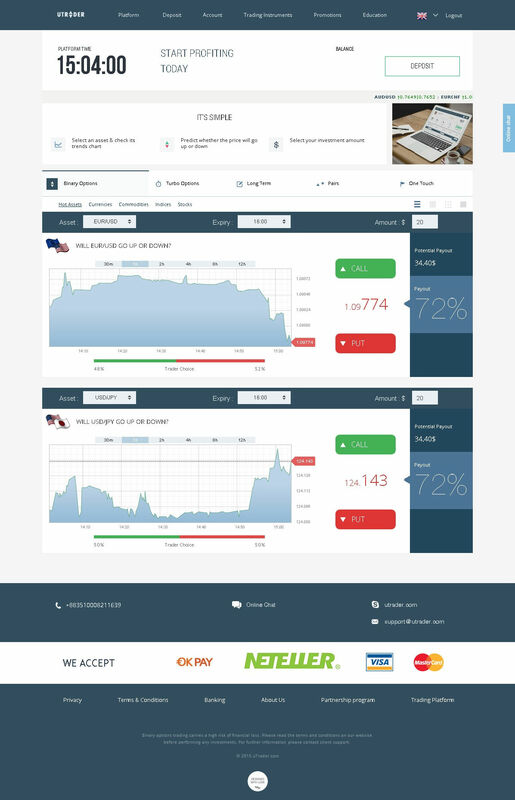 This website is operated by a company called uTrader Day Dream Investments Ltd. As the company is based in Riga, Latvia, they are aiming their services largely at Eastern European customers, but they do take traders from everywhere. Having taken a close look at their features and benefits, they appear to offer a lot of flexibility and great features. The company has been in business since 2011, which means they have more experience than a lot of their competitors. If you decide to open an account on uTrader, you must deposit a minimum of $200, or the equivalent in your currency. uTrader accepts not only the standard US Dollar, Euro, and British Pound transactions, but also allows you to open an account in Russian Ruble or Polish Zloty. You may use credit or debit card, wire transfer, Neteller, or OKPAY to deposit and withdraw money. Right now, the deposit form only seems to support OKPAY, though these other payment methods are all listed as acceptable. It is a good idea to deposit at least $301, because this will get you a Start Account. For $1,001 or more, you may open a Silver account. If you deposit $5,001, you get a Gold account. Each tier comes with a bonus—50%, 100%, or 120% respectively. The Start level also includes an introductory video and daily market reviews along with other educational videos. At the Silver level, you add a personal finance analyst and two trading strategies. The Gold level includes an enhanced account review with an analyst and more technical and fundamental analysis education. Keep in mind many educational resources that uTrader provides are free and accessible to all. Glancing at the Education center, where you can find the FAQ and glossary, I see a pretty standard selection of beginning and advanced eBooks and videos available for free. The resources are not really comprehensive, but they are reasonably complete for a binary options broker. What happens when you need to make a withdrawal from your account? Your first monthly withdrawal is always free, unless it is a wire transfer, which carries a $25 fee (a typical fee amount). Subsequent withdrawals carry a $12 fee. You must withdraw $25 minimum. While no threshold and no fees would of course be preferable, these are both very reasonable amounts. A lot of brokers will charge you fees of $30+ and will also require you withdraw at least $100 or more, so this is really quite flexible! uTrader uses the popular SpotOption platform, which you may be familiar with since it is pretty ubiquitous. The platform is designed to offer great ease-of-use and functionality. You can trade as much as $5,000 and as little as $5 (Turbo Options). $20 is the minimum investment amount for all other trade types. Trade types include High/Low, Turbo Options (fast trades like 60 Second trades), Long Term Options, Pairs, and One Touch. This is neither the biggest nor smallest selection I have seen, but it is reasonably diverse. There are 154 assets to trade, including stocks, indices, commodities, and currencies. This is quite a lot of assets, and more than you probably will ever need to use. While uTrader does not offer a demo account, there is a practice feature which you will find listed under the Promotions tab at the top of the page. This feature is labeled as “Insurance,” and essentially takes the form of risk-free trades. The only restrictions mentioned are the types of options you can use the insurance for (High/Low and Turbo), and that you only take one risk-free trade at a time. From the looks of things, lost trades will be docked from your account, but the money will be refunded within one working day of the trade. Assuming there are no other limitations, this looks like a pretty good alternative to a demo account, and far better than nothing at all. I recommend that you talk to an account manager about this, because this is a feature that is well worth taking advantage of before you start trading live with real money. What if you need assistance while you are trading, or with your account? uTrader offers access to their customer service team via email, live chat on the website, Skype, or telephone. No one was in attendance at the live chat desk when I checked, but as it was a Sunday, this is not at all surprising. If you are anywhere in the world looking for a good binary options trader, uTrader may be a great choice. This company is willing to accept customers from the USA, which is great news if you are located in America and want to trade with a quality broker. If you are in Eastern Europe, uTrader would also be a particularly good choice. While uTrader could improve their services by offering a full-fledged demo account, their risk-free trades appear more useful than the overly restrictive versions offered by other brokers. Likewise, no fees or minimum withdrawal thresholds would be preferable, but those the company has opted to set are far from unreasonable. The trading resources are handy, there are a good variety of trade types, and the interface and the website are both easy to use and navigate. This looks to be a promising broker which may very well deserve your business. Can you prove your words with something real? Empty talk now means nothing, you know. If you have problems and you can document them, contact the regulator then. He’s mentioned on the website and it is his function to solve such problems (if they do exist). Personally I had no problems with funds withdrawal on Utrader, although I’ve withdrawn different amounts many times. And this broker suits me in general. I’ve successfully traded there and have no reason to reproach it for anything. I’ve seen this broker in several ratings. I’ve spoken to the support, the conditions they offer seem to be alright, and there are bonuses too. Tell me please, how does the terminal work, any problems with it? Is it comfortable to use at all? No, they are not ok. Do not put your hard earned money with them. I trade on utrader and generally I’m in the black. The profit’s withdrawn quickly, without any problems. I just don’t understand why this broker has a changing profitability percentage? Do not use this company, they are not registered and lie to take your money. Russian regulated????LMAO. I have sent several complaints to FMRCC, not 1 reply. I don’t know how these people r still in business. Recently, I switched to a silver account on Utrader. The initial deposit is from $3k there, I’ll try portfolio investment in a little bit. Several types of portfolios with different average percentages of profits and risks are offered there. I’d like to try a “”beginner”” one. The broker offers about 2% of profit at low risk and 5% at high there. I think it makes sense. Well, we’ll see. And Utrader is not the worst broker in general, it has everything you need and most importantly – it does everything written in the terms. Funds withdrawal is done as said. It’s really strange to read this without seeing the evidence. I’ve learned the rules before opening an account on Utrader (I didn’t work with options before). I had no confidence in the turnover, so I refused the bonuses (the rules fix the mandatory turnover for bonuses). I made first funds withdrawal in a month. I was asked to verify the account first, so the withdrawal took several days, and the rest took no more than two days, as indicated in the regulations. This is my first broker after the annual exchange trading courses. I accidentally heard the mentors talking to each other and decided to ask about the broker in the next lesson. They recommended it as one of the most reliable. I immediately opened a silver account, that is the one from 3,000 bucks. Today, everything’s in perfect order, I know how to trade, and therefore I receive +4% monthly as sure as death. It’s nice to deal with such broker as Utrader.